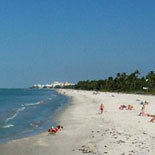 Situated on Florida’s gulf coast, Naples is renowned for its shopping, dining and culture. The city has a historic town center and white sandy beaches. When visiting Naples, consider these top 10 family friendly attractions. Aboard this tour you’ll see more than 100 points of interest like the Naples Museum of Art. During the 31-mile journey, a knowledgeable guide provides an interesting narration of the city’s history and little known facts. You can hop off, explore sites at your own pace and then re-board another trolley to continue the tour. This 11,000-acre nature preserve was created to protect the bald cypress. Along the 2.25-mile boardwalk, you can observe Florida’s natural wildlife. Inhabitants include alligators, whitetail deer, black bears and a wide variety of wetland bird species. This zoo has approximately 70 species of rare animals, such as the honey badger, striped hyena and Malagasy fosas, which display canine, feline and mongoose characteristics. Visitors can feed giraffes and see primates during the Lake Victoria exhibit cruise. Kids and parents alike will enjoy exploring this natural wonder with an experienced eco-tour guide. You can cruise across the river of grass aboard an airboat. The Everglades is home to sawgrass prairies, carnivorous plants, orchids, alligators, crocodiles and flamingos. Visitors will learn about the Native Americans who live here and the conservation efforts to save this one-of-a-kind habitat. This 6,400 acre state park features salt marshes, mangrove and cypress swamps. It is home to alligators, raccoons, Ospreys and pelicans. There are nature paths, camping and picnic areas as well as a canoe trail on the Blackwater River. See the historic Bay City Walking Dredge that helped build the Tamiami Trail across the Everglades. The entire family will have fun exploring nature in an Old Florida setting. During a 90-minute buggy tour, experienced guides provide insight into the native flora and fauna. There is also a museum featuring the history of Florida that served as the setting for the Sean Connery movie “Just Cause. Looking for a way to entertain each member of your family? Visit Capt Steve Swamp Buggy Adventure and you’ll embark on an exhilarating 3 to 4 hour tour of the Big Cypress National Preserve. The eco-friendly vehicles enable you to experience Florida’s unique sub-tropical environment. Your knowledgeable guide provides entertaining and educational information about the indigenous plants and animals that inhabit the swamp. This landmark consists of 35 acres of mangrove swamp, coastal dunes and white sandy beaches. Ride the tram or take the boardwalk from the parking lot to the beach and experience the rich biodiversity, including several unique species of mangroves. The handicapped accessible beach is considered one of the best in the country. Enjoy the amazing weather of South Florida at this family water park that features a lazy river ride, several exhilarating slides, wave pools and an interactive play area. Children can splash and swim in a pool or experience the thrill of the chutes and slides. The inner tube ride on the lazy river and its water soak feature is a great way to cool off. This museum is a two-story, 30,000-square-foot facility that provides a nurturing environment for young learners. Children can enjoy interactive exhibits, like a produce market, an art studio, an eatery and a green construction project. Other exciting activities include a journey in the Everglades and amphitheater performances. The museum makes special accommodations for children with learning, sensory and physical disabilities.